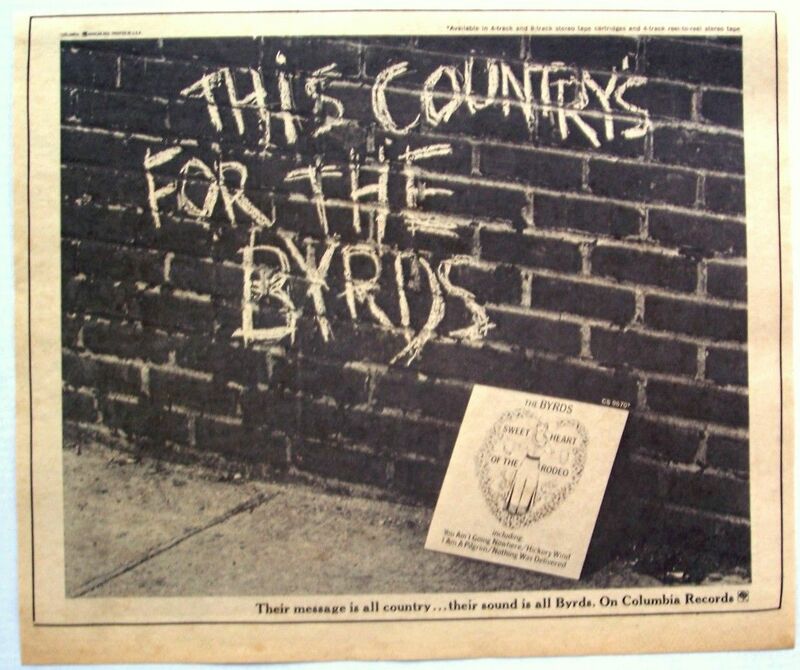 In 1968, when the rest of the pop music world was recovering from psychedelia, the Byrds went country. The group's album, "Sweetheart of the Rodeo," embraced classic country sounds, with lots of pedal steel and twanging Telecaster guitars, along with a little banjo and mandolin thrown in for good measure. New member Gram Parsons, recruited into the band after the departure of David Crosby, contributed lead vocals on several tracks and two original, destined to be classic, tunes: "Hickory Wind" and "100 Years from Now." 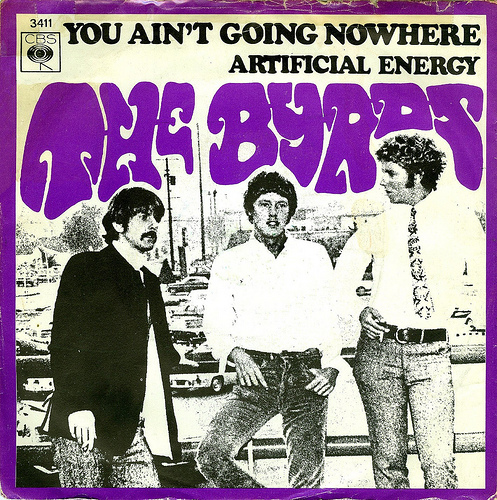 The Byrds, famed for their hit version of "Mr. Tambourine Man," routinely included a Dylan cover or two on their LPs and, for this one, recorded two songs from his "Basement Tapes," a collection of demo recordings Dylan made with the Band during his post-motorcycle crash hiatus from public performance: "You Ain't Goin' Nowhere" and "Nothing Was Delivered." Tunes by country legends such as Merle Haggard ("Life in Prison") and the Louvin Brothers ("The Christian Life") along with a banjo-driven version of Woody Guthrie's "Pretty Boy Floyd," helped round things out. The album, released on Aug. 30, 1968, failed to do much business on the charts but succeeded in alienating both rock fans, many of whom weren't open to the album's country sounds, and the country music establishment, who viewed the band as dilettante interlopers. Following the release of the album, the group played a disastrous set at the Grand Ole Opry where they were the subject of constant heckling and suffered a hostile interview with the legendary Nashville disc jockey Ralph Emery, who called the group "mediocre." 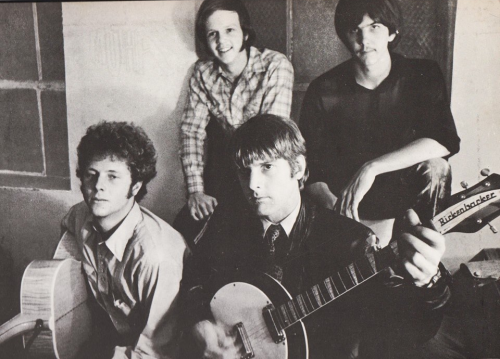 McGuinn and Parsons had their revenge by writing a tune lampooning Emery, "Drug Store Trucking-Driving Man," that was included on the next Byrds LP, "Dr. Byrds and Mr. Hyde." Parsons' stay with the Byrds didn't last beyond this album, but he continued to follow his country muse - stealing Hillman away to become a member of his Flying Burrito Brothers, and later recording a pair of excellent, seminal country rock albums, "GP" and "Grievous Angel," both featuring the unbeatable blend of his smooth country voice with the harmonies from Emmylou Harris. "Sweethearts of the Rodeo" wasn't the first attempt at blending rock and country. After all, country was part of rock from the start. Elvis Presley, Chuck Berry, Carl Perkins, Jerry Lee Lewis and other first-generation rockers created the genre by melding country, blues and r&b. Dylan had a deep love of country that creeped into much of his work. Even the Beatles, in their BBC recordings and live performances played the occasional country tune. And, from the country side, Buck Owens and others in the Bakersfield scene blended rock'n'roll guitars into to their honky tonk sound. 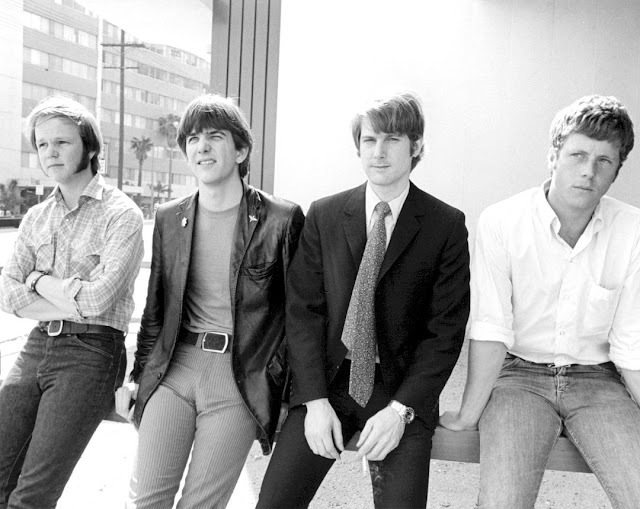 Parsons, too, worked to fuse country and rock before his stint in the Byrds, with the album "Safe at Home" with his short-lived International Submarine Band. 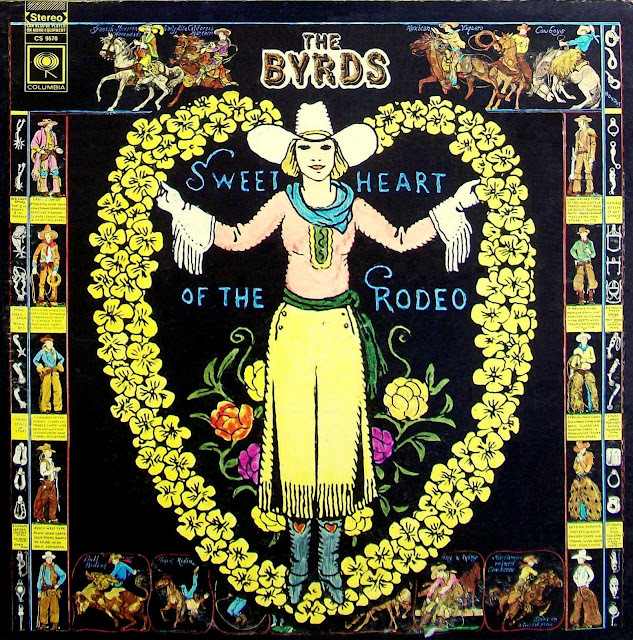 Still, "Sweetheart of the Rodeo" is rightly hailed as a pioneering country-rock and went on to inspire a raft of country and rock'n'roll artists, ranging from Poco and the Eagles to the Outlaw Country movement and Steve Earle to alt country bands such as Uncle Tupelo and the Jayhawks. McGuinn and Hillman recently celebrated the album's 50th anniversary in performances backed by Marty Stuart and his band and plan a wider tour, playing the LP in full. Here's our own little celebration with images and videos of the time.